Burjuman: A mall filled with luxury brands and high-end designers in Bur Dubai. Deira City Centre: Located in the community of Deira, Deira City Centre was the largest mall in Dubai before Ibn Battuta Mall, Mall of the Emirates and the Dubai Mall were built. Deira City Centre has over 340 shops, including a Carrefour superstore. Dubai Mall: the World’s largest shopping complex offers all the major brands, so whether you’re looking for a new pair of shorts, or a handmade leather suitcase, you’ll find it there. Home to the Dubai Aquarium and Underwater Zoo (the World’s biggest aquarium), and an Olympic-sized ice rink. Festival City: Located on the Creek, many expats find this shopping centre as soon as they land as it’s also the destination for IKEA and ACE (a large DIY store). Mall of the Emirates: The second-largest mall, after the Dubai Mall, and home to Ski Dubai, which offers real snow and penguins. Mercato: This Italian-style shopping arcade is smaller and more manageable that the larger malls. Mirdiff City Centre: Located on the Emirates Road, Mirdiff City Centre is home to a wide range of shops, restaurants and cafes. It also has a 10 screen cinema complex, and an "iFly" indoor skydiving center. Ibn Battuta Mall: Named after a 14th Century Arabian scholar and traveller, this themed one storey mall is divided into six sections. 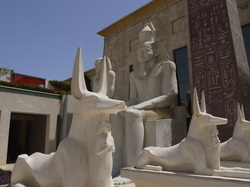 Wafi: An Egyptian themed mall, complete with pyramids. Groceries: One of the hardest challenges when you arrive in a new country is identifying new brands and learning where to go for what. If you’re looking for grocery shopping try Spinneys, Choitrams, Union Co-operative, Park & Shop, Lulu’s, Geant or Carrefour.